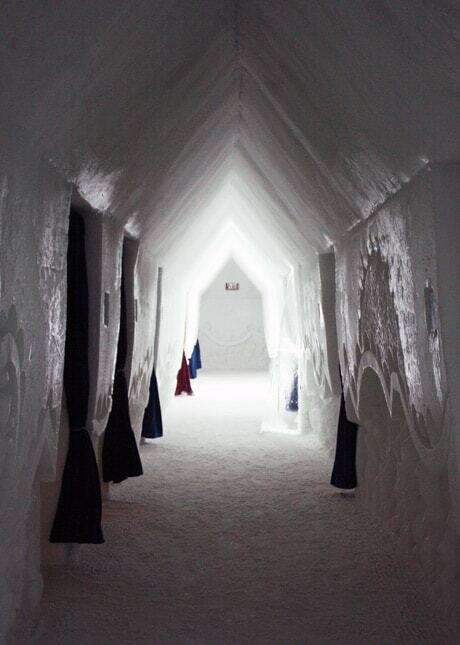 Last week, I’ve finally had the chance to tour Quebec City’s famous Hôtel de Glace, or ice hotel. 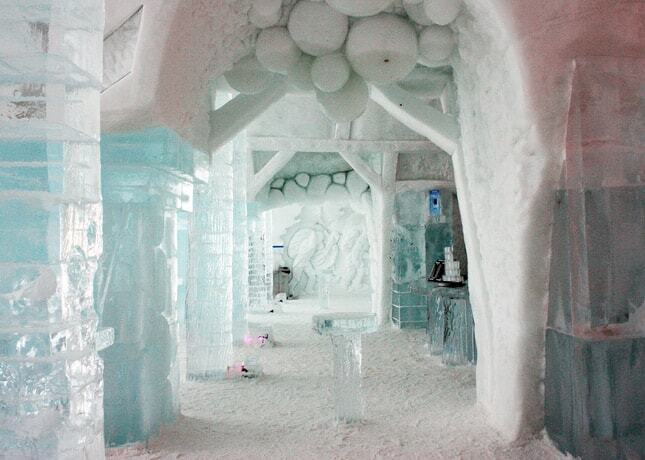 Although the hotel’s been operating every winter since 2001, I had never seen it with my own eyes. 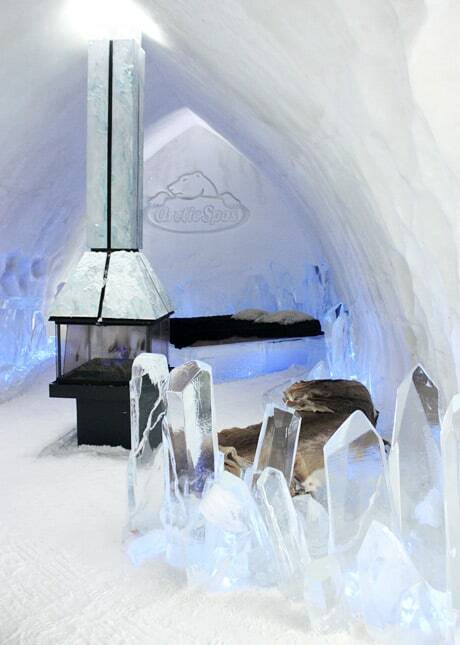 Every year, the hotel is built anew from the ground up, allowing visitors to wander in a magical wintery atmosphere and, for more adventurous travelers, to live a one-of-a-kind experience by sleeping at the hotel, on beds carved in ice. 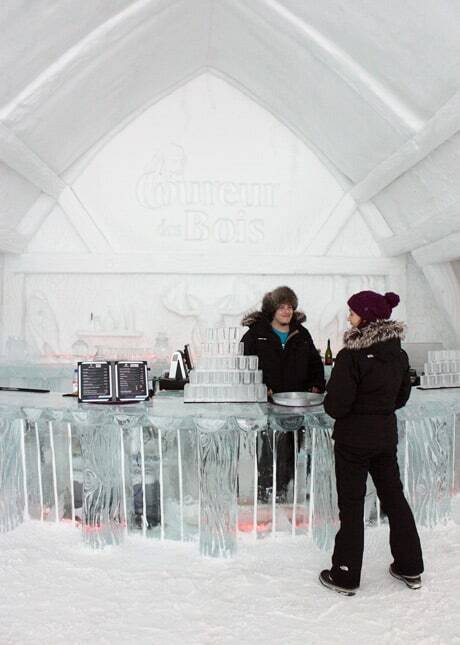 The concept was inspired by a similar concept in Sweden, and it has become one of Quebec City’s iconic winter destinations. The hotel is gorgeous, but what’s even more fascinating is the work that’s required to build it: every year in December, once the temperatures have dipped below O°C (32°F) for at least a week, a team of approximately 50 people start working on the construction of the hotel, which takes six weeks to complete. 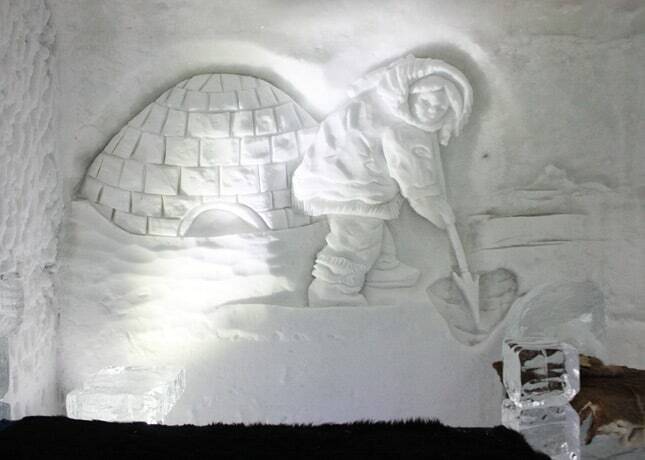 Thirty workers are on the production team and 15 sculptors work on carving works of art out of ice and snow. The hotel’s main construction material is snow, made on site with snow blowers (the same kind that are used in ski resorts). Over 15,000 tons of snow are needed to build the hotel, and it needs to be made mechanically to make sure it’s humid and dense, so it will become hard as ice. 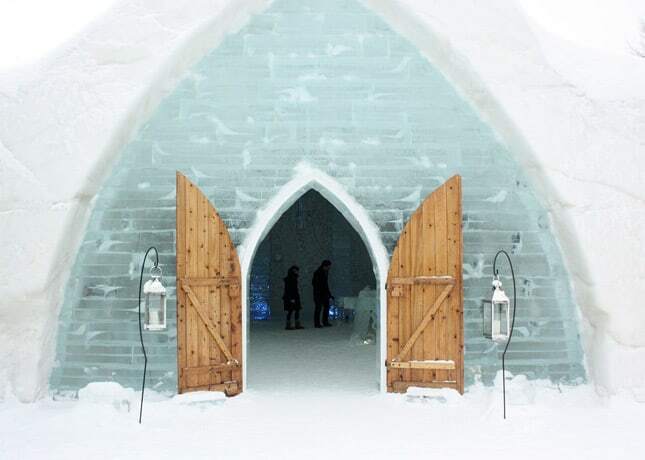 Natural snow is too dry and airy to be used – and although Quebec City does get lots of snow every winter, there would never be enough falling on the construction site to build a hotel. A solid foundation needs to be built to support the hotel’s heavy weight, and then metal molds are used to make the different architectural parts that needed for the construction. The hotel’s structure is quite impressive: walls are 1.2 meters (4 feet) thick, and the highest vaults are 5.4 meters (17.7 feet) high. 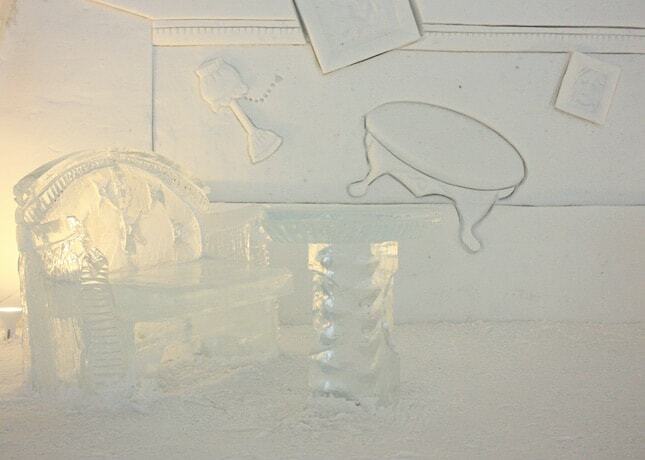 Once each section is completed, 500 tons of clear ice blocks come in to be carved into furniture, columns, sculptures and ice glasses. 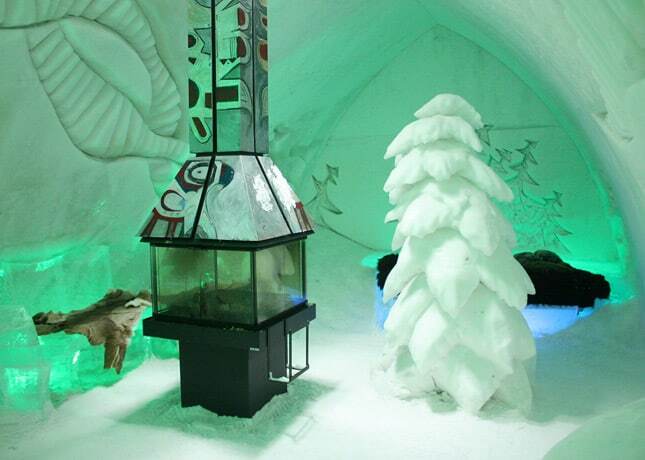 The Hôtel de Glace is the only ice hotel in North American that’s entirely made of snow. It sprawls over 3,000 square meters (32,000 sq. 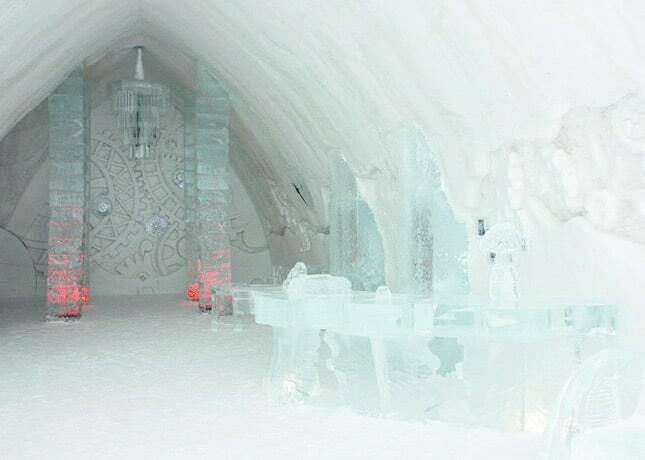 ft), counts 44 guest rooms, and features a giant ice slide, a bar, a chapel and a spa. The hotel has greeted 800,000 visitors since 2001, 35,000 of which have stayed overnight. During the day, all guest rooms are open to the public, so you can wander around the whole site and peek into each and every room. Each room is closed by a velvet curtain, red marking themed suites, blue marking regular rooms. No two themed suites are alike; each one has its own personality, custom furniture, carved art, and some even have a fireplace. The most luxurious suite also has a private spa. 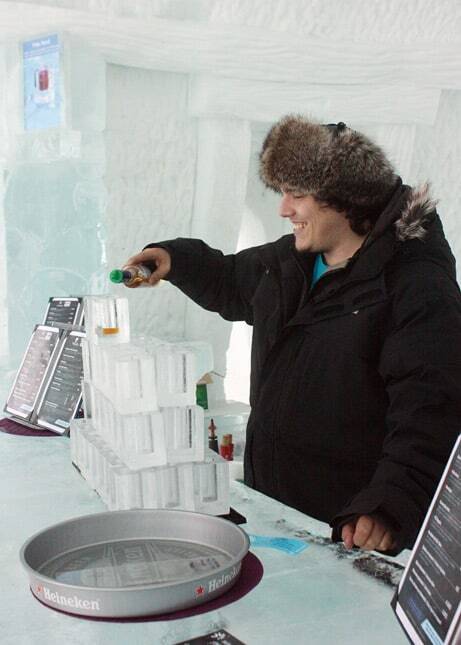 Overnight stays are what have made the hotel so popular among visitors seeking a unique experience in Quebec City: visitors have the chance to sleep on ice beds in outdoor temperatures, which can vary from -25°C to 5°C (-13°F to 41°F). 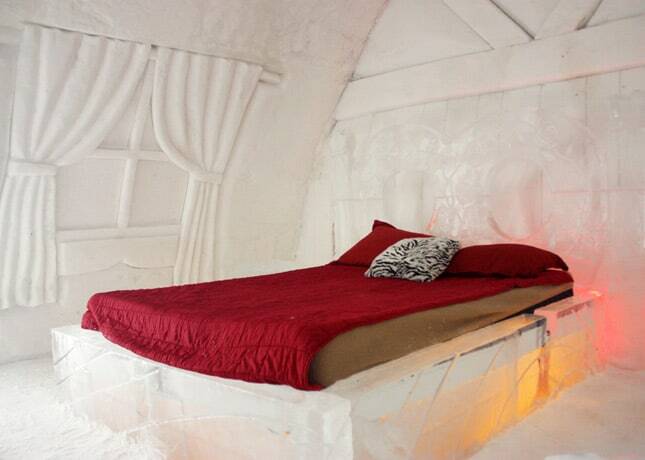 Even though beds are made out of ice, visitors have a surprisingly comfortable stay: blocks of ice composing the base of the bed are topped by a solid wood base and a comfortable mattress. At night, insulated bed sheets, very warm sleeping bags, and pillows are delivered to each room. The hotel provides all the necessary information concerning what guests should wear to stay warm, and at check-in, guests must attend a training to properly prepare for their stays. If sleeping with a woolen cap on isn’t your thing, you can also come as a visitor and enjoy the site’s many activities. 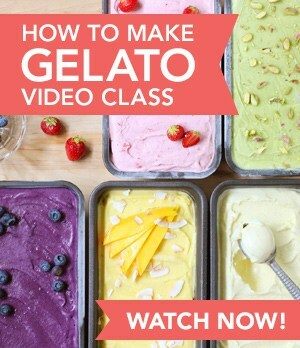 There are guided tours in English and French every day, a sugar shack on site, and a bar, where I’d love to spend the night dancing and drinking cocktails with friends. 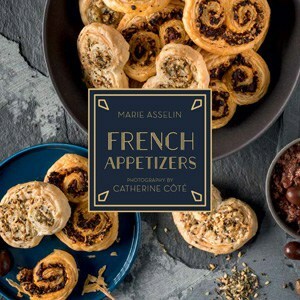 I was impressed by the cocktails list: they’re creative and many highlight specialty liquors from Quebec, such as ice wine and maple cream. 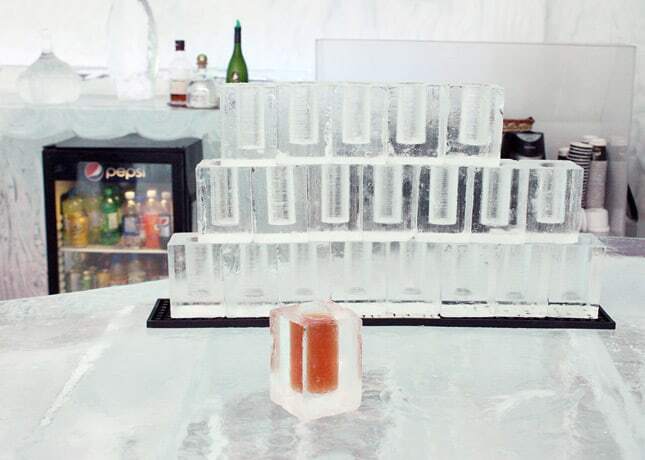 All cocktails are served in ice glasses, which are all painstakingly carved by hand on site. You can even carve your own if you choose to do the “Behind the Scenes” tour. 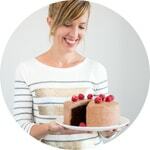 A fun touch – the glasses are great conversation starters, I even kept mine! It’s sitting in the freezer, waiting for the next cocktail opportunity. 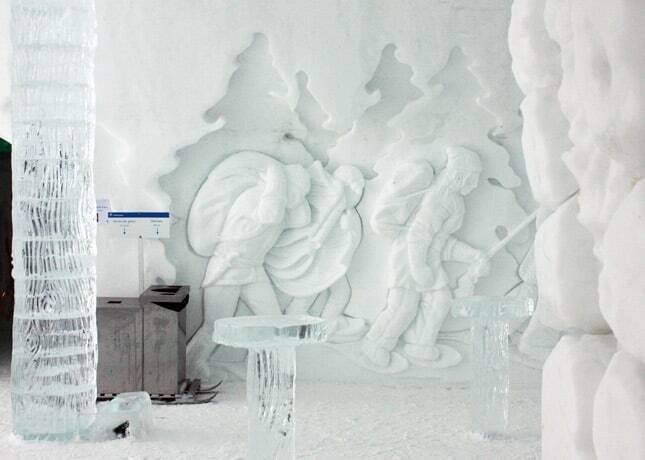 I was blown away by the fine work done by carvers all around the hotel. Some murals are true works of art! I was told that once the work is done, it keeps into shape pretty well even when it’s warmer outside, but the hotel does close right at the arrival of spring, on March 24. 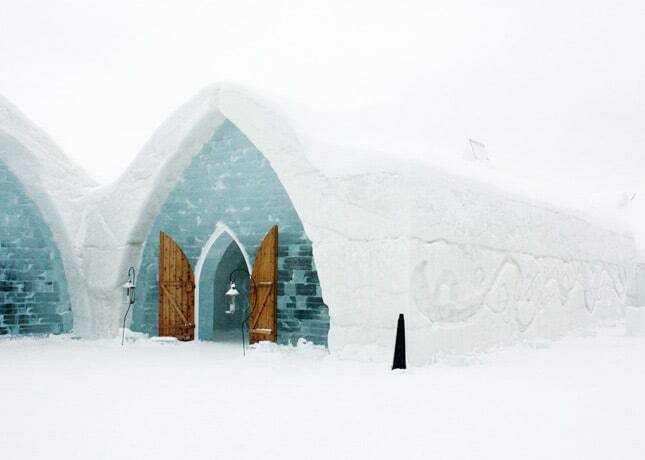 Ice hotels have become a popular winter attraction for people seeking unique, off the beaten path experiences; Montreal even has its own snow village now. 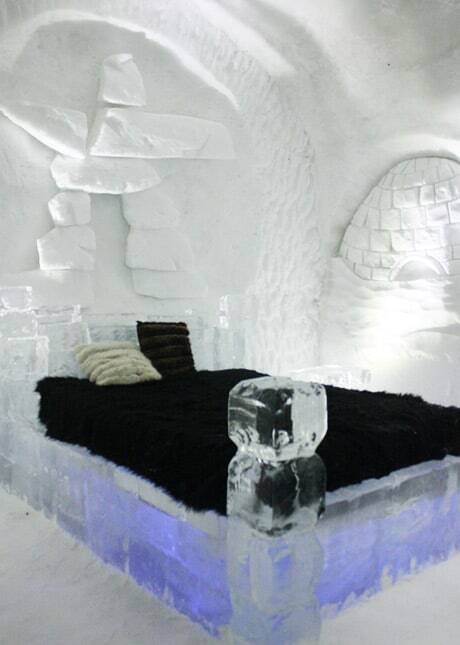 Would you be interested in sleeping in an ice hotel? Full disclosure: I toured the hotel for free as a member of the media. I was not asked to write an article about the tour or the hotel; all opinions are mine. How amazing! 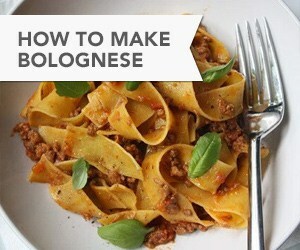 This just made my “must see” list! Thanks for sharing!!! It’s a very interesting place to visit! If you ever go and stay overnight, please let me know how you liked it! Wow, this is so ghostly and beautiful. It reminds me of one of my favorite F. Scott Fitzgerald stories “The Ice Palace,” which doesn’t have a happy ending, I’m afraid. But I can imagine it unfolding in these rooms! 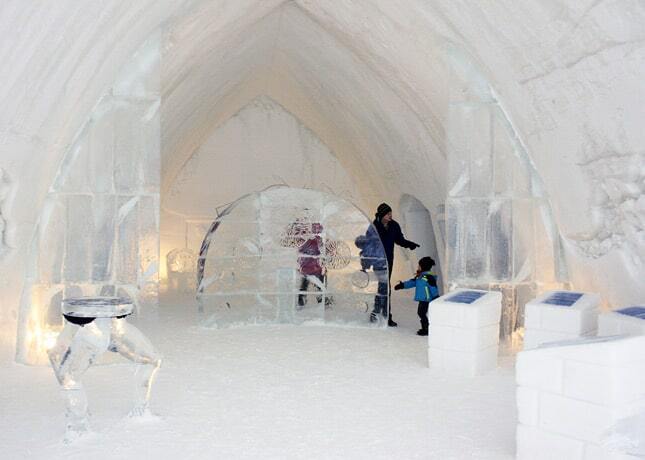 Thanks Ann for mentioning “The Ice Palace,” never read it before, and I just found it online! 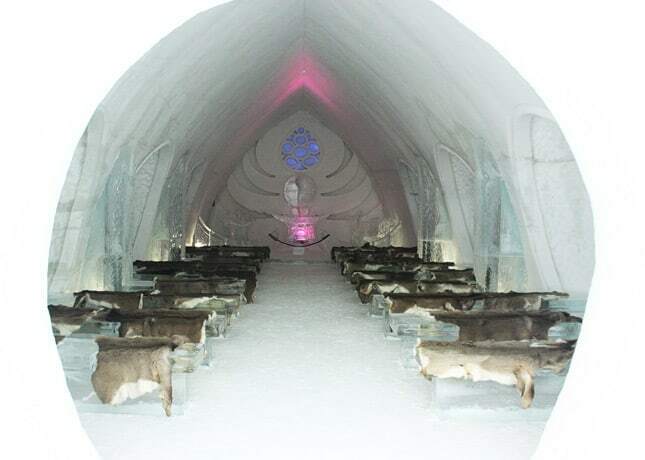 Movies and TV shows are filmed at the Ice Hotel once in a while, so perhaps there will be an adaptation of Fitzgerald’s story shot in there one day?